#7254 Smooshee Critter Cuddlers "Poppie Puppy"
#7254 Smooshees Critter Cuddlers "Poppie Puppy"
Description: The Poppie Puppy set includes a Smooshee puppy dog, and a dog house that the dog can be smooshed into. This is one of several friendly Smooshee pets called Critter Cuddlers that were sold with a natural habitat they can be smooshed into. Designed for children ages 4 years and older. FPT14930 - Poppie Puppy - Small stuffed Smooshee puppy dog with a printed face and other features. Poppie has a white body, orange ears with hot pink inner ears, an orange tail with a white tip, and hot pink pads on the bottom of his feet. Poppie has orange spots around his eyes, pink-tinted cheeks, black and green eyes, a black nose, and a black mouth with a red tongue on one side. Has a purple printed collar around his neck with yellow rectangular designs. 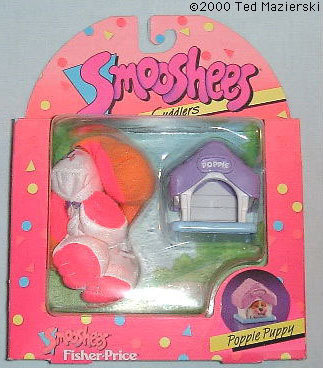 Not marked with a model number, but was sold with a small sewn-on tag marked with a "S" for Smooshees. FPT14931 - Small squared doghouse with a square light blue base, white siding-simulated walls, and a purple shingle-simulated roof. The front of the doghouse has an anched door opening with a sign above the door marked "POPPIE" in white.